Established in 1986 in memory of X. A. Kramer, Jr., the Kramer Outstanding Teaching Award is presented annually to a DWR composition instructor for outstanding teaching. Congratulations to current and past recipients of this award! 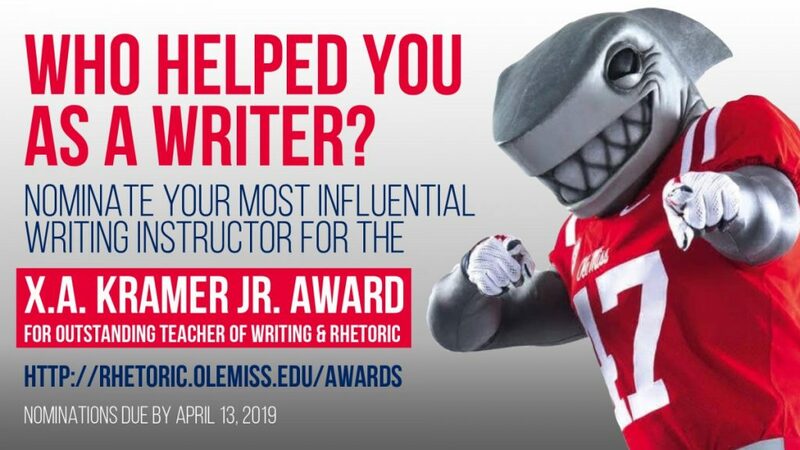 Established in 1990 in memory of Ole Miss student Cynthia Krieser, this award is presented annually to a first-year composition student who exhibits outstanding writing. A panel of W&R instructors reviews and selects the winner from the nominations. This annual award is open to all students with freshman status in WRIT 100/101 or WRIT/LIBA 102 courses during the calendar year. Work should be submitted that was completed during the student’s freshman year, even though they may no longer be a freshman student at the time of the award selection. Nominations may be made by individual students and/or DWR teachers of record for coursework submitted by one of their freshman students.